Dev Diwali was recently celebrated in Banaras and Ganga Mahotsav has just concluded. The holy month of Kartik is the season of festivities and the rituals of connecting with the Almighty in one way or the other. I have memories of Banaras being choked with the influx of religious tourists from far corners of India and curious tourists from all corners of the world during these festivals, I rarely gave any importance to the festivals other than the traffic that got deadlocked during these times. What was it that attracted flocks of tourists and travelers from far away places to Banaras? I am finding the answers slowly and believing more in the theory of the world being a global village. 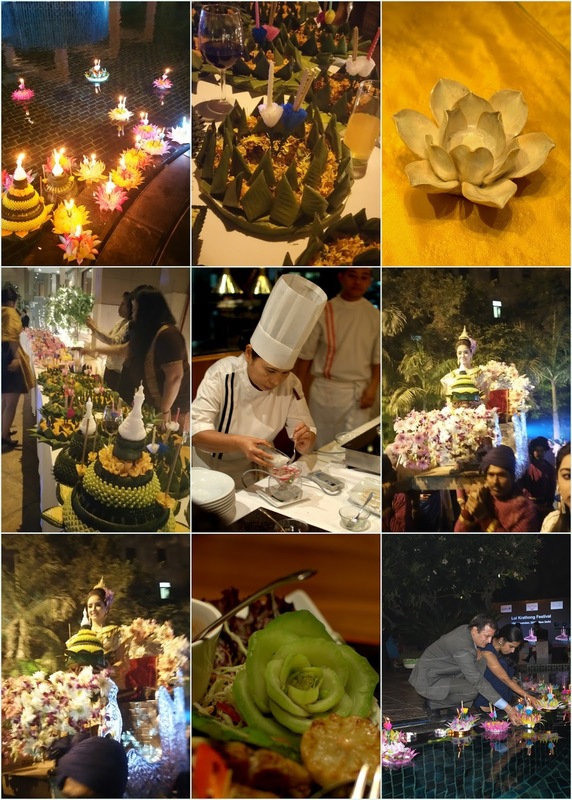 We were invited to the Loi Krathong festival being celebrated at Radisson Blu Plaza a few days ago. The celebration was organised jointly by Thailand authority of Tourism and Radisson Blu Plaza and we witnessed a few dance performances and Thai Boxing (Muay Thai), the artists and boxers were flown in from Chiang Mai (Northern Thailand). Loi Krathong is a festival of lights in Thailand and it is celebrated on the full moon day in November, coinciding with the Poornima of Kartik month, the day when we celebrate Dev Diwali in Banaras, Guru Purab in Punjab and Karthikayi in Tamilnadu. I got to know recently that a harvest festival in Coorg called Puthari is also celebrated on the same day. There has to be a deeper connection to this simultaneous celebration in different regions with their roots in Hinduism. Hinduism being the oldest surviving (pardon me and enlighten if I am wrong about the chronology) religion and having branched into a few more religions, Hindu rituals have a deeper connect with the elements of nature, seasons, harvests and rivers I believe. The rituals are a form of living history. After the cultural program we saw a palanquin carried Miss Loi Krathong to the pool area where she invited the guests to float the Krathongs (boats) in the pool. I was not carrying my camera so a few cell phone pictures are being shared. It was quite a ceremonious floating of decorated lotus shaped floral boats in the sparkling pool of the hotel. The lotus shaped Krathongs were made of paper, on a base of Styrofoam that helps the Krathong float in the water. I wish the Krathongs were made of real leaves and flowers, we need to take care of the 'environmental sanctity' of the water bodies too. A candle and few incense sticks are lit in each Krathong before floating it in the water body after making a wish. In Thailand couples do this ritual together and this festival has taken a romantic hue. The lighting and floating of the Krathongs reminded me of many such rituals followed by Hindu pilgrims in cities like Banaras, Haridwar, Ayodhya, Nashik and many other places. The fire over water symbolism has a deeper meaning, I have been reading about it. Will definitely share sometime. I must tell you that Banaras celebrates Dev Diwali in a very interesting way. All the ghats are lined up with very high Bamboo poles, a Bamboo wicker basket is ascended to the top of each of these poles with a burning lamp (Diya) every evening and the sky gets lit at the ghats with thousands of these lamps hanging from Bamboo poles. These are called Akashdeep, meaning skylights, and are meant to please the Gods. Hence the name Dev Diwali or Dev Deepawali. Both Loi Krathong and Dev Diwali are celebrated on exactly the same date every year. People float lamps (ghee ke diye) in leaf boats shaped either round or conical, there are a few marigold, rose or lotus flowers in these floating leaf boats as an offering to Ganga ji (the Mother Ganges), such beautiful rituals have survived thousands of years of civilization. After the ceremonial floating of the candles, the dinner was served buffet style by Neung Roi, the best Thai restaurant in the city and we stuffed ourselves with our favourite salads (Som tam, Thai pomelo salad and raw mango salad) and then the fruits and desserts. Most of the salads were served in individual serving bowls at the salad counter of the beautifully laid out buffet by Neung Roi, but the Som tam (Raw papaya salad) was being made at a live counter with all it's usual trimmings. 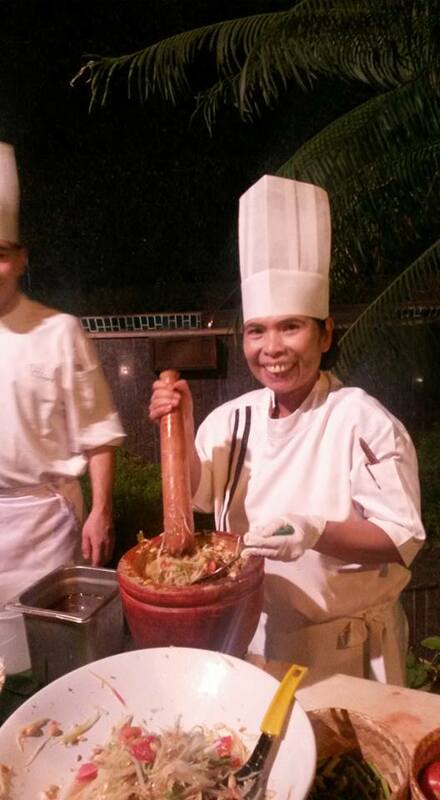 Chef Suthiwaja herself hand pounded the salad in a huge wooden mortar and pestle. At Neung Roi you will be spoilt rotten if you love salads and want several helping of different salads. The Thai fruits of the buffet were too good to resist so we skipped mains very conveniently and enjoyed what we love the most without feeling stuffed. While trying to find out more about the possible links between all these festivals being celebrated on the same day in different regions of India and Thailand, I realised religious festivals serve many functions, some more central that others to the dominant religious tradition within a given culture. Loi Krathong in Thiland (a Buddhist country) has little to do Buddhism as a doctrinal system (source). Although this festival appears to be animistic or Bramhanical in origin, it has become at least partially assimilated into the Theravada Buddhist cultural traditions of countries of southeast Asia. According to The Buddhist World of Southeast Asia by Donald K. Swearer, Loi Krathong is a festival related to harvest cycle, celebrated after the back breaking work done in the fields to plant the paddy crop. A way to relax and enjoy. The origin of the Loi Krathong in Thailand (see source) according to the earliest evidence, it was started by the second queen of king Phra Rueang (ca 1300 C.E.) who was the daughter of a Bramhin family attached to the court, in order to please the king. There are a few more theories in other parts of Thailand but interestingly one of the theory says that the Krathongs are offered to Mae Khongkha (mother Ganges), the mother of all waters. Isn't it interesting to find the mention of Maa Ganga in the tales of origin of this festival? All the festivals in every religion and every region is linked to seasons and harvest cycles, or the mountains or water bodies. One way or the other. The symbolism may or may not be relevant in the modern world but the religious connect to nature is evident. Thanks to Thailand authority of Tourism and Radisson Blu Plaza for the hospitality and a grand show. I hope to visit Thailand soon and explore more about the cultural similarities we share.